The nation’s favourite canny cartoon canine is here again with another bumper collection of his most chucklesome strips from the Daily Mail. Scottish-born Alex Graham quickly established himself as one of the country’s best-loved cartoonists, with his work appearing in numerous publications such as Tatler, The New Yorker and Punch. 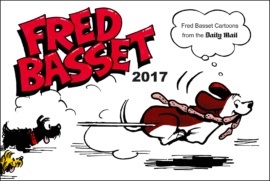 When asked by the Daily Mail to create a new strip cartoon, Fred Basset was the result. Fred’s adventures and wry look on life have appeared every day for over 50 years. Alex died in 1991. The strip is continued by Alex’s daughter Arran and the talented artist Michael Martin. Fred Basset enjoys worldwide syndication.